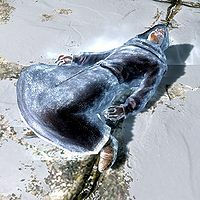 Rundi is a dead Nord found near an altar at an unmarked location east-southeast of Winterhold. Frost runes surround the circular stone plinth on which Rundi lies. There are some items on the altar itself, such as Rundi's dagger, a few alchemy ingredients, a soul gem, and a copy of the Alchemy skill book Mannimarco, King of Worms. You can find a set of blue mage robes and a pair of boots on Rundi's corpse. Rundi and his twin brother Borvir are mentioned by Phinis Gestor as the missing apprentices from Winterhold. Rundi was to be included in two unfinished quests. In the first, you are tasked with finding him and the three other missing apprentices. In the quest, you bring Rundi's Dagger back to Phinis Gestor, who will say, "It certainly is. Was, I suppose. He would never have willingly parted with it. What a shame." In the second, he and his twin brother would open up a popular meadery in Haafingar, and you would be tasked with bringing their mead to either Candlehearth Hall, The Bannered Mare or The Frozen Hearth. Rundi's body may despawn or glitch through the ground. Rundi's body provides infinite feedings for werewolves, but will not advance Dawnguard's werewolf perk XP. This page was last modified on 9 February 2019, at 14:15.